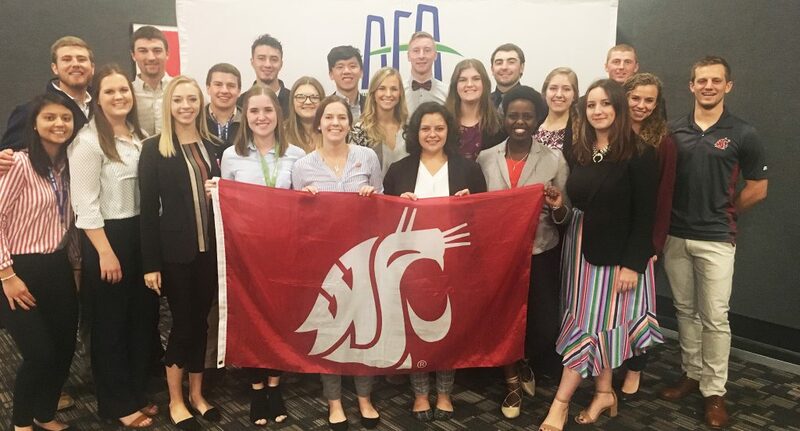 CAHNRS students attending the 2018 Agriculture Future of America (AFA) Leader’s Conference in Kansas City, Mo., are, from left, front row, Rebeca Velasquez, Emma Winker, Megan Gould, Andrew Gutierrez, Kayla Beechinor, Elea Van Weerdhuizen, Macy Hagler, Gracie Dickerson, Samantha Reyes, Amanda Martian, Vanessa Giramata, Juliana LeClair, Alex Johnson, Sarah Appel, Randall Chipman; back row, Colm Allan, Brent Rosman, Adrian Lopez, Cody Wang, Luke Wolfisberg, Kenton Lyman, Keith Gfeller. More than 20 students from the College of Agricultural, Human, and Natural Resource Sciences travelled to Kansas City, Mo., to attend the 2018 Agriculture Future of America (AFA) Leader’s Conference, Nov. 1-4. Students developed their professional skills, networked with industry partners from across the country and made friends with peers from more than 99 colleges. CAHNRS’ AFA delegation thanks all of their sponsors for making the trip possible. • Learn more about WSU students attending the conference here. • Learn more about Agriculture Future of America here.